Sony is about to release two new hardware bundles for the PlayStation 3. The Medieval Moves: Deadmund's Quest and Everybody Dance bundles provide gamers with everything they need to experience the PlayStation Move motion-sensing technology. 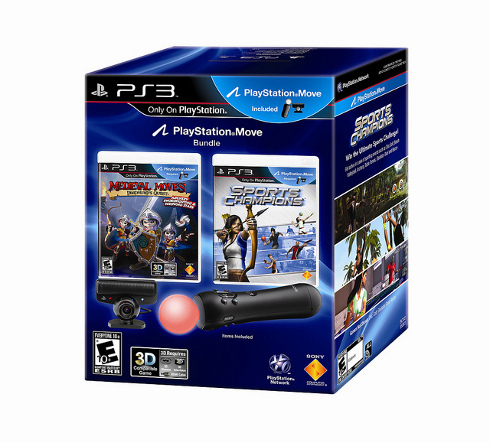 The Medieval Moves: Deadmund's Quest bundle comes with a copy of the medieval action game, a Move motion controller, a PlayStation Eye camera and a copy of Sports Champions. Champions allows players to compete in athletic events like volleyball and archery. In Medieval Moves, players use the Move motion controller to swing a sword, toss throwing stars, and shoot arrows. The Everybody Dance PS3 package includes a 320GB PlayStation 3 system, a PS Move controller, a PS Eye camera, and a wireless controller. It's priced at $299.99. That's the same price that the 320GB PS3 normally sells for so you're essentially getting the PS Eye, Move controller, and game for free. You'll find the Deadmund's Quest Move bundle at retailers across the United States next week. The Everybody Dance package is now available at Target.